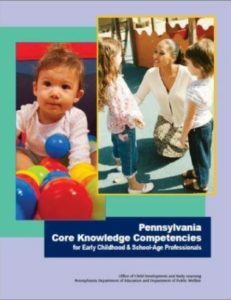 The Pennsylvania Core Knowledge Competencies for Early Childhood and School-Age Professionals (formerly known as the Core Body of Knowledge) is an essential component of Pennsylvania’s professional development system. It identifies a set of content areas that help define the knowledge expectations for professionals in settings within the early childhood and school-age field. It supports students’ preparation for entry into the field of early childhood and school-age care as well as professionals’ commitment to lifelong learning through ongoing professional growth. This revision is designed to be more inclusive of all group settings and updated to reflect revised learning standards and current research on best practice. 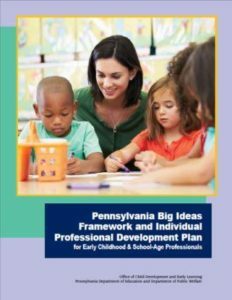 The Pennsylvania Big Ideas Framework and Individual Professional Development Plan for Early Childhood and School-Age Professionals (formerly known as the PDR) is a companion document to the CKCs. It is a summary of the core competencies presented as Big Ideas and Essential Questions and will be the primary tool for consideration of long and short term professional development goals and the creation of professional development plans for individual early childhood and school-age educators. ** NOTE: This form cannot be filled out and saved in your internet browser. You must download this document to fill-out and save it. Someone will contact you with payment instructions.